Scooby Doo is one of the most loveable canines in animation history, and starred in one of televisions longest running cartoon series. He stops chasing ghosts and sandwiches long enough to strike this classic pose in front of the Mystery Van, graveyard and spooky house. 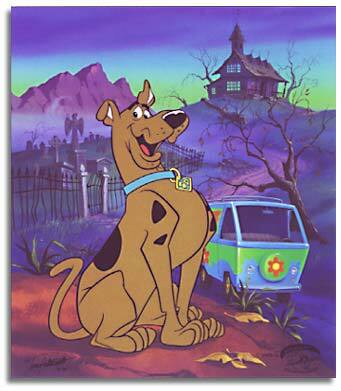 This fine art Hand Painted Limited Edition Cel was created by Hanna-Barbera artist Iwao Takamoto, who created Scooby.